So how do you take a photo of your prize turnip? That’s just one of the questions puzzling me this week. The other immediate thought is why on earth am I photographing my prize turnip let alone who’d have thought a few years ago I’d be asking myself these questions! Let’s face it, it’s not everyday you ask yourself how do I take a decent photo of a turnip that you’ve grown. Or maybe I’ve just led a very sheltered life?! A break in the clouds, a spare hour or two and a face up to facts moment saw me making my first trip to the allotment since before Christmas. I’ve been avoiding the trip to the plot. Maybe if I’d known there was a “prize turnip” waiting for me I’d have dashed up earlier but in all likelihood it wouldn’t have tempted me, let’s face it a turnip doesn’t normally excite or arouse deep passions in even the most keen gardener-cooks! And here’s where I fess up, my heart hasn’t been in it. I didn’t want to be there. And I certainly didn’t want to take my camera with me. Well I’ve broken the spell today – maybe next week we’ll see if I can take my camera with me. We need to step back in time to understand my reluctance. Before Christmas there was a monster storm here. The kind that bends trees, generally picks things up and throws them around, think of a two year old having a kicking screaming fit a real temper-tantrum of a storm. A storm where you lie in bed at night listening to the wind howl down the chimneys and roar over the roof. The sort you wonder when you wake up, “what is the damage?”. The house was spared but the allotment wasn’t. Reports of sheds in trees reached us. And sure enough there was damage. My greenhouse was battered beyond recognition. Not just the windows blown out but the whole frame was twisted and contorted. It looked as if a herd of elephants had trampled through, tossing the frame around this way and that. In fact think of two year old elephants having a hissy fit and you’ll be able to picture it! Wreckage was what was left. And because life throws busy periods at you it still hasn’t been cleared away. That’s now a priority as I simply can’t face going there much until it’s out of sight. A good clear up operation is needed. A weekend of clearing, tip runs and copious cups of tea are required along with help to cart the wreckage away and to cheer my spirits. The greenhouse will be replaced ………. If you are the sensitive kind, the sort of person who is squeamish about horror films, gore and guts then look away now! The photo that was relayed to me by phone…..
mangled is the right word Celia, but I keep telling myself it’s “only” a greenhouse…. Oh, Honey! That’s just awful…but the old shed is still there? A bit of good news. 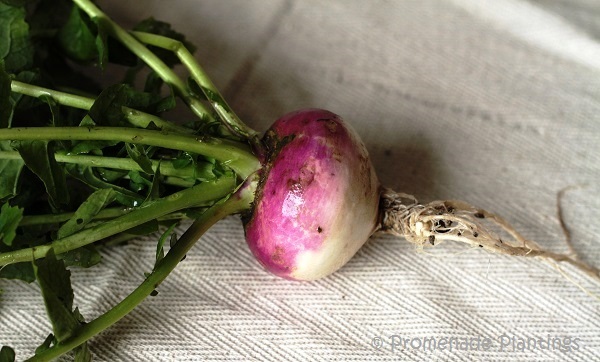 Your turnip photos are quite lovely – could you bring yourself to eat it, after all that? Thinking of you as you rebuild and find your heart in it all again. Looks devastating but your list of positives is inspiring. Lifting a cup of tea to cheer you on as you plant and restore. Thank you Karen, I wonder what our respective gardening year will bring?! I know…it will be interesting to see what the bitter cold and snow has done to my perennial gardens in Maine this year. I think I’ll be replacing lots of plants during our short growing season there. Amazing how pretty you made that turnip look. How terrible that your greenhouse was battered in the storm. I hope you get it all cleared soon with lots of help so you can start planting again. Farmers/gardeners seem to be eternal optimiststs that way. I was reading some turnip recipes and apparently the best are the small ones, better sweeter flavours, so I’m looking forward already to tomorrows lunch ! I think I know exactly how you feel, so my commiserations! But it can only get better, today the sun is out, it is calm and a skylark was serenading me as I walked across the croft. Enough to chase away the wet winter blues. As for turnips – can’t stand them! Claire, I am so sorry to hear and see the news regarding your flattened greenhouse. I know you will rebuild and start again. After all, you need to grow beautiful turnips again. I was so reluctant to click “like” — there’s not much to like in the wake of destruction. As sorry as I am to see the mess that Mother Nature — or the herd of elephants left — I’m thrilled that you will rebuild and that your garden mojo will return. Just don’t lose sight of the miracle in the wreckage: a prize turnip — a beautiful garnet-colored jewel of a turnip — survived Mother Nature and the elephants. Be well. Be strong. And keep on growing. 🙂 Thank you Kevin, the winter has been long, grey and oh so wet here and today was a beautiful bright and warm sunny day. A joy. So I already feel better about life. I just need to get my act together and get sowing some seeds! Nothing like seeing a few seedlings emerging is there?! Not good that so much was lost, but as you’ve shown with your turnip photo there is something positive and even beautiful in every situation. I allays look for the positives, sometimes they are a bit thin on the ground but they are there if I look hard enough. Oh dear Claire, I’m so sorry for the damage to your greenhouse, that’s so sad. I hope that there are bits that are salvageable and that you will rebuild it when spring comes. I too can see why it would dampen your spirit. But on the plus side you have an incredibly beautiful turnip which will taste wonderful in one of your recipes! We’re hoping to salvage a few bits and use them on the 2nd plot and the dilapidated greenhouse.. we’ll see in a while whether that will work and if not I’ll have to do some research and scout around for a replacement – which I’m sure will bring surprises and fun Eva! That is the downside of gardening, isn’t it, Claire, when nature in some form provides surprises: storms, droughts, infestations. Chin up and have those cups of tea to warm your spring. Here in sunny, drought-declared California I have put the first few plants into my bare dirt yard: I started with donated red cabbage seedlings, kale (! ), parsley and chard. Then I bought my first Sun Gold tomato plant. I covet sugar snap peas and many kinds of beans and butternut squash, but I am chiefly wondering how much I need to plant to feed two hearty eaters and have some things to put by for the winter. Do you have a post on gardening for two or plant yields or garden planning or some such thing? P.S. I put some bulbs in a planter under the front window so that we will have a few flowers this spring. I’ve been reading about the droughts in California, that’s a tough time to start a garden, but I admire your spirit and wow you have made a great start! And you’ve made me think about yields and the like – no I haven’t done a post on that (maybe I should  ), I don’t tend to count or weigh. The one thing I should make clear is that I always sow more seeds than will be needed – you lose some to germination problems, then some just look week and weedy and when you plant them out you invariably lose a few more. And if I have too many seedlings then I either give them away or compost them. My other bit of advice would be to be prepared to deal with gluts, but as you buy seasonally you are already good at this! Just get ready with the canning and freezing (I blanch a lot of veggies and pack them away in a small freezer for use over winter), either that or invite family and friends round to regular meals, everyone I know loves home grown veg so there’s very little persuasion needed. Oh and only grow what you love to eat! Peas- 4 wigwams of 12 plants each, Beans (snap) about 36 plants (they are my favourite veg), shelling beans probably 12 plants (sometimes more), Kale 6 plants, Chard 4 and Spinach 4 or 6, Tomatoes 6 to 8, garlic 50 to 75, Courgettes 3-4, summer squash 2, winter Squash 8 to 10 plants, Cucumber and Gherkins 4 to 6 each, Brussels Sprouts 6, corn is planted in rows of 4 by 4, radishes are sowed in small batches regularly, and beetroot is only grown for me so a handful of seeds sees me through, lettuce is sown in small and regular amounts, potatoes I probably plant about 20 in total but that’s because we don’t eat many and they last ages, I grow lots of leeks as they do well over winter here – to be honest I should grow more (maybe 30+). And this list doesn’t include things like carrots, fennel, parsnips, mooli, winter radish, sprouting broccoli, red cabbage, or fruit! Maybe I should write that post!! Thanks, Claire. It will help. You grow a bigger variety than I am starting off with: I need to get some skill under my belt (or hands) so I’m starting with things I have grown before, things we love — tomatoes and beans! — and things I have grown before. How terrible that your greenhouse got so badly messed up! Hope its up and running soon…The best gardeners dust off their pants and move on, I know you will too:) On the other hand, the turnip looks great! I like your image of dusting my pants off, it feels like thats what I should and will no doubt do! I did think about Baldrick when I wrote the post this morning……. can’t help but associate the two! Hi Anne Marie and thank you! I bought some Pink Fir Apple and some Mayan Gold, both are maincrop so it will be late summer before i get to eat them. I may buy some first earlies, we’ll see if I have room for them on the allotment! What a shame! You have put your heart and soul into the allotment! I do hope you have the time and energy to start again this spring. Your garden adventures are such inspiration. And that is one mighty fine turnip! I think I need to make the time and the energy will follow. It has been a rotten winter in terms of storms but I know in comparison to a lot of people I got off lightly ! I’m so sorry to hear (and see) the greenhouse so badly damaged. That must have been quite a shock. I easily understand how knowing there is so much repair work has put a pall over your seed starting enthusiasm. I assume that others have also been negatively affected by the storm and maybe you’ll all need to band together for general clean-up and then just ease slowly back into your previous routines. That beautiful turnip is indeed a prize and goes to show the resiliency of all growing things! I wish we were all able to pitch in and help, Claire! I wish you were around the corner too – you could make the tea and shout encouragement! So sorry to hear Mother Nature took some of her anger out on your allotment. I hope the clean up reinspires you. That is one beautiful turnip! Oh, the delicious dishes to be made! I’ve found I really like the small turnips, and especially like stor frying them with soy sauce. delic! HI Claire. I understand exactly how you are feeling. My previous greenhouse was supposed to my forever greenhouse, but it blew apart in the first storm a week later. I cried. I also found out that you can’t insure a polycarbonate greenhouse in the hours before a storm – and probably not ever. After repeatedly patching it back up and looking for lost panels I had no love for it and I took great pleasure in pulling it down to replace it with a stronger glass one! A destroyed greenhouse is a fabulous opportunity for a new beginning. I hope you have a fantastic start to spring. OMG Sarah, a week before it was blasted to smithereens, I would cry too, in fact thinking about it is bad enough! My friends greenhouse was also trashed – hers was glass so she’s been picking up shards for months now, luckily mine was toughened plastic so a trip to the rubbish dump is needed. 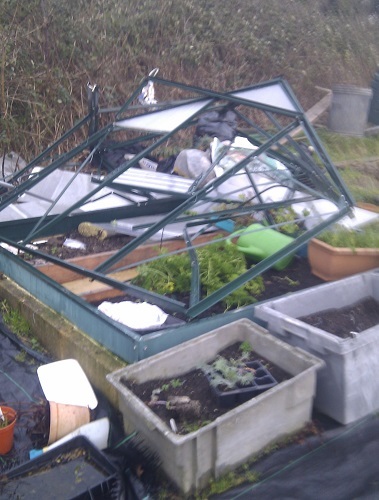 I need to have a re-think and do some research – but I suspect there will always be the possibility of storms and storm damage, I’d just like to minimise it if I could…..
Oh your poor allotment–and that greenhouse… I wish I were near enough to offer to help. On a lighter note, I did obsess on photographing a bunch of radishes last year. Your turnip turned out better! Ah if only we were neighbours Inger! every now and then there’s a photo you want to take but “staging” it seems to take over! Hi Claire. You poor thing. Just think about those seeds you brought. Seeds represent new life as does spring. All will be new again soon. egads, that WAS a bad storm! I remember reading about it, and hearing from Maggie’s fiance (who was in Ireland at that time) how sidewalks and roads around his house there has buckled, and sunk, and how waves had washed all manner of trash up into adjacent neighborhoods. I’m glad you got things straightened away….and also glad spring is waiting for you just around the bend! In comparison to other parts of the country we didn’t suffer that much damage, our electricity stayed on, we weren’t flooded so yes I’m lucky! Oh this is terrible! Not the turnip though, that’s pretty but the poor greenhouse! The Turnip was tasty 🙂 the greenhouse needs to go to the dump and I need to start again ! What a shame. We’ve had storms that blow out panels but so far nothing major, fingers crossed. Yes, it seems you were very lucky. Every time the disaster shots came on the news, I wondered how it would relate to some of my English blogging friends. Spring’s springing in some parts, I understand. Hope it pops up in your direction soon. Oh my goodness, how heartbreaking to see your greenhouse like this. Am hoping you have a gaggle – a team – a gang – or at least 2-3 friends who will go over there with you to help with clean up and rebuilding. and a lovely cup of tea and some special goodie as reward for all the hard work! I can’t wait to see what you come up with, Claire! It is bound to be more beautiful than before, of this I am certain! I am sorry I missed this post of yours…not sure how that happened, but I am sorry about your allottment problems, but happy that I just read a newer post where you rescued your little prize turnip. Spring must be right around the corner?